Are you struggling with slicing your driver, or simply not getting enough distance with it? Here are some tips on how to hit a driver long and straight every time. The game of golf is full of nuance, strategy, and delicate shots that can make or break your round. Touch feel, and finesse are all important aspects of the game that make the sport so wonderful and unique. That said, we all love to crank it off the tee. If you have ever spoken to anyone at all who golfs, I’m sure you’ve heard the often uttered phrase, drive for show, putt for dough. In other words, the long ball is a good way to make yourself look cool, but matches are really won on the green. There is some truth to that. I would certainly admit that matches are won on the green, but they can be lost from the tee. If you find yourself punching out from the trees on every hole, it doesn’t matter how many fifteen footers you make. You’re going to lose the match. Don’t neglect your short game, but certainly don’t underestimate the importance of the long ball either. Today we will be looking at a few simple ways to straighten out your drives and add distance to every swing. The tips that you will find in this guide are all accurate, and certainly, they are good advice, but remember that there is no substitution for practice, nor the watchful eye of a professional. That said, without further ado, here are some tips on how to hit a driver with increased accuracy and distance. My guess is that a lot of people with a few years in the sport are going to scoff at the heading of this section, and then move on, but I hope that it isn’t so. A good set up is one of the simplest and most effective steps you can take to achieve distance and accuracy, and unfortunately, it is also an area in which most players are lacking. Let’s start with the grip. Out of every aspect of the game, the grip may very well be the most basic. To start, there are three conventional ways in which you may grip the club. Interlocking, overlapping, or baseball grip. For the interlocking, the pointer finger of your left-hand interlocks with the pinky of your right hand. With the overlapping grip, the left pointer overlaps on top of the pinky, and with the baseball grip, there is no overlapping or interlocking at all. It seems that right now the interlocking grip is most popular, but all three are perfectly valid ways to hold the club. Chose the one that you are most comfortable with, and then move on from there. Once you have decided how you would like to grip the club you will want to place the grip in your palm, ascending horizontally up your fingers. Now, close your fingers around the club so that they are wrapped completely around the grip. The space between your thumb and pointer finger should make a V that points up to your right shoulder. With your right hand, you will place the grip on the thumb pad of your hand, and allow it to ascend vertically up the palm. Now, close your right hand around the grip so that the space between your thumb and pointer finger make another V pointing towards your right shoulders. The best way to check if you’re using a proper golf grip is to check the Vs. The golf stance is fortunately fairly simple. Spread your legs a shoulder length apart, bend your knees slightly, allow your arms to hang comfortably in front of you so that there is no tension, and allow your spine to bend ever so slightly so that you are leaning into the ball. For the long ball, you will want your weight to ever so slightly favor your left foot. Since we are dealing with the driver in this guide you will want to play the ball just inside your left foot so that you catch it on the upswing. And that is it! A standard stance with the driver. While the best way to straighten your drives is through practice, there are simple alterations to your stance that will help you find the fairway in a pinch. If you find that you are slicing the ball excessively, move your right foot slightly back so that it is no longer parallel to your left foot. This will help you get through the ball a little bit more which will promote a straighter shot. If you are hooking the ball you will want to move your left foot slightly back, for the same result. You can also adjust your stance in this fashion if you want to hit a draw (right foot back) or a fade (right foot back) but you should, in general, strive for a set up in which your feet are parallel. It’s easy to get your club face square to the ball, but you also need to make sure that your body is positioned to promote a swing path that will keep your shots on line. The best way to do this is to focus on alignment with every single shot that you hit on the range so that you can carry those good habits out onto the course with you. How is this done? There are a number of ways, I am sure, but the simplest method that I have found is alignment sticks. Alignment sticks are exactly what their name suggests they would be – thin sticks designed to help you aim properly. To use them, simply place one parallel to the ball facing your target, and another directly across from the first near your foot line. This will help you get in the habit of setting up so that your body is in a position to help you swing down the target line. Now that you have a solid foundation, you can work on one of the most important aspects of your swing, the tempo. Keeping a good tempo is one of the best ways to improve accuracy, consistency, and even distance so you will want to make sure you are striving for a good tempo with every single swing you take. Conventional wisdom states that players with the best swings in the world take three times as long drawing the club back as they do bringing it down. For as important (and in fact, relatively simple) developing a good tempo is, it’s unfortunately not the easiest thing in the world to practice. My advice would be to come up with a short phrase to think on your backswing. That was what the Golden Bear would do in his prime, and if it was good enough for him, my personal opinion is that it will probably serve the rest of us well too. Back when Jack Niklaus was solidifying his reputation as the greatest player the game has ever seen, he had one simple swing thought as he brought the club back. Low and slow. A simple, three-word phrase that perfectly matches the timing of an ideal tempo. You don’t have to take Jack’s words if you don’t want to, although actually I think they would serve you well should you decide you’d like to. Whatever phrase you chose, just make sure that it helps you come up slowly, and then transition smoothly into a fluid downswing. Remember, a good golf swing builds momentum. There is never a need to get whippy with your hands. Allow the clubhead to collect speed until it reaches its maximum velocity at impact, and you will attain distance without sacrificing accuracy. I’m sure that at this point you have noticed that none of the tips featured in this guide have had anything to do with speed or strength. Certainly, they’ve not once mentioned swinging harder. While it is true that many pros who hit the ball for miles (see Dustin Johnson) have ludicrously fast swing speeds, trying to swing harder isn’t always, or even usually the best way to add distance. Realistically, most players are never going to swing the club at 110 mph. 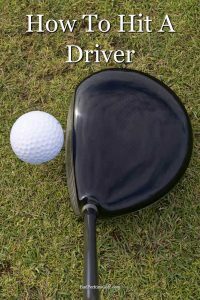 Generally speaking the average male player swings their driver at a speed of 93.5 mph, while the average woman swings her driver at a speed of 78 mph. While it is certainly possible to improve upon those numbers, the easiest way to get more distance is to make the most out of your 93, or 78 mph swing. Fixing your stance, grip, and tempo will do exactly that, and in return, you will enjoy longer, straighter shots. If you feel that you have the setup and basic swing mechanics down, but still aren’t entirely satisfied with the distance or accuracy of your shots, I will also include some drills below that should help you get the drives of your dreams. Once again, remember that the best setting to make alterations to your swing is under the eye of a pro. I love this drill for the sheer simplicity of it. To do the chair drill, all you really need is a chair, and your driver (and of course, some range balls). All that you will do for this one is sit in a chair the same way you usually would, and set up to the ball with your driver, making best efforts to maintain your normal distance from the ball. You are then going to simply start hitting balls. What’s the purpose of this? It eliminates the lower body from the swing and gives you the opportunity to experience how important it is to get your hands firing through the ball. Ideally you will take that onto the course and start getting your hands through the ball a little bit more. This will lead to more clubhead speed, and possibly even a draw trajectory which also promotes more distance. If you don’t have time to go to the range you can also always do this drill from your backyard, and just forgo the balls. Remember earlier I mentioned that a good golf swing doesn’t focus just on speed but on gaining momentum through the ball? That’s exactly what this drill focuses on. The goal here is to take full swings with the driver that gradually increase in speed. Start with a target say, one hundred yards out. Once you hit to that distance a few times, try to increase incrementally to 125, then 150, 175, and so on and so forth. The great thing here is that while you are building to your maximum distance you will be doing it using a nice smooth tempo that is essential for hitting to the shorter distances. By the time you get to the longer yardages you will probably be hitting longer shots than usual simply because of the improvement to your form. A variation of this drill is to take shorter swings until finally building up to your full swing. The execution is, of course, different, but the goal is ultimately the same. Hitting shots with your feet together is a classic drill also designed to help you work on getting your hands through the ball. If you think you might be the sort of person who would get embarrassed bringing a chair to the driving range, this may be a good alternative for you. Well, that’s it. A guide to how to hit a driver straight and long. Keep in mind that while all of these tips will help you hit longer, straighter shots if properly executed, how much increase you see will depend on a number of factors, including how much you practice, your age, fitness, and body type. I know that isn’t what everyone wants to hear. People like products and drills that promise a quick thirty-yard boost to their swings, but the truth of the matter is that those quick fixes are more myth than they are fact. You should always be very skeptical of products that offer quick fixes with minimal work. The great thing about all the tips and drills illustrated in this guide is that not only will they help you pick up a few extra yards, they will also help you make better swings all throughout the bag. Remember, a solid foundation is the key to a good swing, so work on the fundamentals and you can count on seeing better results. Improvement takes work, but if you value a good drive, it’s definitely worth the effort.